Very rarely am I ever still able to find NES games in thrift stores. So when I found these for only about ten bucks, it pretty much made my day– despite three of the four titles being common sports games. 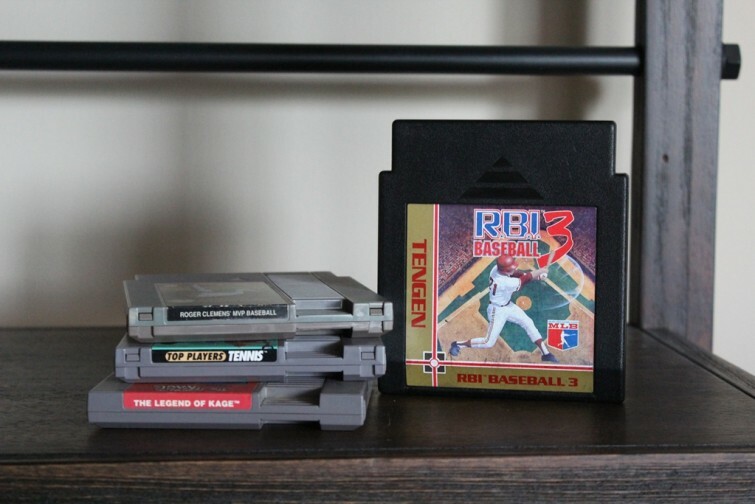 RBI Baseball 3 completes my trilogy of unlicensed RBI Baseball games. Roger Clemens’ MVP Baseball and Top Players Tennis are two more common titles that I had been looking for. The Legend of Kage was an 1985 arcade game by Taito that was later ported to the NES. As many of you may know, Taito made some of the best and now some of the most valuable and sought after games for the NES. The game appears to be an action side-scroller, so I’m really excited to pop this one in and play it. The game was popular enough to warrant a sequel on the Nintendo DS called Legend of Kage 2 over two decades later. 2015 is off to a decent start for me. With catching up on various projects and settling into my new post-graduation life, there’s little time or money for NES games. But I’m still determined to finish the NES quest by year five and I’m confident I’ll be able to reach this year’s collecting goal of having 450 NES games in my collection with at least five of them being valued at $100. This trade brings my collection from 253 to 257 NES games. For the rest of the entries of NES Quest, check them out right here on Retro Chronicle.